SquareSpace is one of the best-known names in website hosting, with a media campaign that’s incredibly popular among tech-friendly consumers. A2Hosting, on the other hand, is something of a cipher – it rarely advertises and doesn’t have a very high profile. The two hosts are, though, among the best out there. This A2Hosting vs SquareSpace web hosting comparison analyzes a number of factors including performance, prices, features, security, customer service, and usability. By looking at all of these factors, a clear victor will emerge. 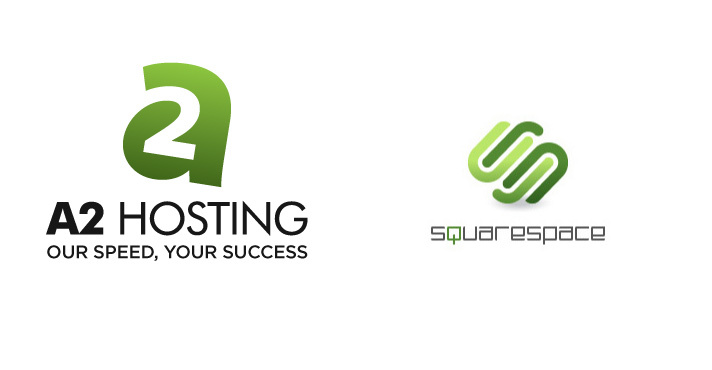 In pure performance terms, both SquareSpace and A2Hosting are actually quite good. They are both incredibly responsive hosting platforms with a better-than-average amount of reliability. A2Hosting seems to be geared a bit more towards power users, while SquareSpace is a little more newbie-friendly, but both work well. If you’re measuring nothing but pure speed, though, A2Hosting blows SquareSpace – and virtually every other host on the market – out of the water. A2Hosting is somewhere in the vicinity of 20 times faster than other hosts, so it’s definitely got high-speed performance locked down. Thanks to its blazing speed, A2Hosting takes the win in this category. Both A2Hosting and SquareSpace have a number of different packages for different types of users. While they tend to trend among the same names – packages separated by casual use, e-commerce, and enterprise level – the two services are very different in practice. A2Hosting is a top-notch platform for users who already know what they are doing, while SquareSpace is an all-in-one service that helps users set up websites with minimal fuss. They serve two different populations, but both do so well. Who wins? If you’re paying month to month, A2Hosting is much cheaper. If you’re going yearly or you need a high-end package, SquareSpace wins. As SquareSpace’s premium package gives much more for less, it wins this category. Both of these hosting services are actually quite safe. They both provide a basic level of security free of charge to their users, which seems to be becoming rare in today’s world of bundled services. Both also provide back-up services, at least at a basic level. While A2Hosting only provides a site rewind, SquareSpace provides free traditional backup services. Both are good about keeping your data safe from outsiders, but only SquareSpace will really help users after a data loss disaster. SquareSpace is the clear winner in this category. There is no contest here – SquareSpace wins. The service is designed around making web hosting and web design easy for novices and it provides a number of great templates and tools to make that claim into a reality. A2Hosting also provides a number of good tools, but they’re not easy to use. A2Hosting may have some real advantages, but they’re the kind of thing that requires an experienced user. If you’re looking for sheer user-friendliness, SquareSpace wins. SquareSpace and A2Hosting both have very good customer support. They’re both great about getting back to you about issues, but A2Hosting will really hold a user’s hand during the entire problem-solving process. A2Hosting seems to have more available channels for help and each has a great response time. SquareSpace doesn’t do bad in that regard, but the lack of a phone support option can be troubling. SquareSpace does, though, do a better job of initial set-up. It has much better tools for helping users solve their own problems. Unfortunately, that’s just not enough to help them here – A2Hosting’s fantastic team gives them the win in this category. These are two very different hosting solutions. A2Hosting really is a good product, especially if you already have a great deal of experience working in the field of web design. Its industry-leading speed and great customer support make it one of the best hosts out there. It’s SquareSpace’s ease of use, though, that really makes the most difference. It is easily one of the most user-friendly hosts out there and thus will fit the needs of more users. SquareSpace grabs the win, but only barely. What do you think about these two hosting services? Does A2Hosting’s technical might outweigh SquareSpace’s user-friendly nature? Let us know by getting in touch with us!